Wine production is Marchesi De’ Cordano’s main vocation. Marchesi De’ Cordano Company is located in Loreto Aprutino, in the ancient Terra dei Vestini. In the 2000s in that place called Loreto Aprutino the young Francesco D’Onofrio assisted by the know-how of the enologist Vittorio Festa proudly carries on the expression of the territory. 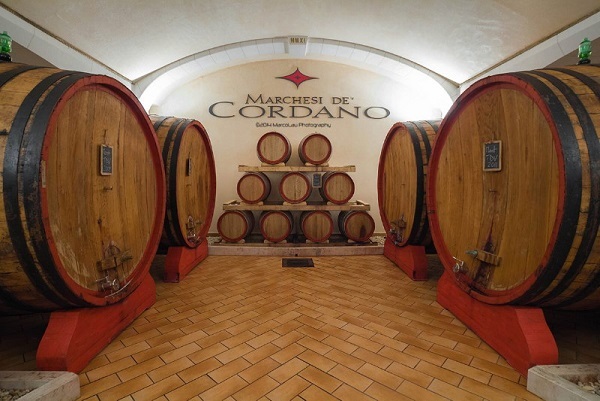 The MARCHESI DE’ CORDANO winery manages over 43 hectares of vineyards, where grapes are constantly monitored, controlled and picked at their best and use is made of advanced wine making technology. The MARCHESI DE’ CORDANO Estate complies with HACCP standards and regulations. The growing, production, bottling and logistic cycles are being certified under UNI EN ISO 9001 under the control by the influential Festa Laboratories. The wines are completely pure and are guaranteed free from any additives such as paraffin, cyanic and methyl compounds. Its wines are also suitable for vegetarians since it does not use any gelatine to alter the natural fermentation process of the must. We believe that our hard work, our equitable and accountable decision-making process and our many awards and certificates are evidence of the high quality of our wines.